Posted by Denise Deby. Thanks to Carol Burnup, EnviroCentre for the information. 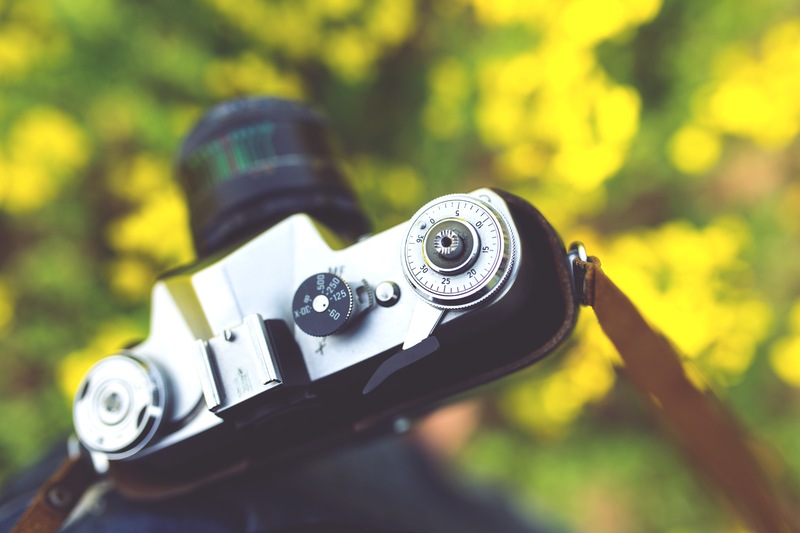 EnviroCentre is holding its first photo contest on the Spirit of Sustainability in Ottawa. You’re invited to submit photos that celebrate how people in Ottawa are making the city more sustainable. Show us how you improve everyday energy use in your home! It can be something like changing to LED lighting, using Energy Star appliances, or making grand scale green renovations. 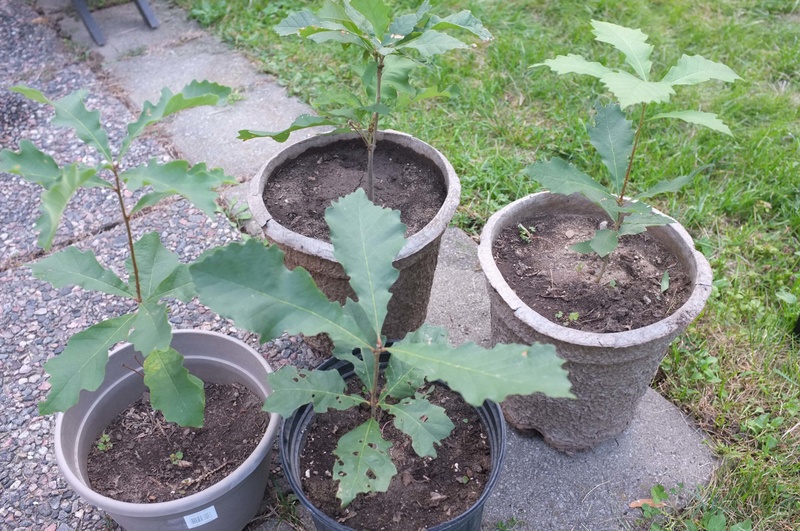 Does your business have a green team? Are you turning computers off at night to save energy? Or providing incentives to staff to take transit or bike to work? Show us what you’ve done or are doing! What are you, your family, friends or community members doing to make your neighbourhood a better place to live? Are you using your bike to get around or building a community garden? Show us your sustainable community or what you’re doing to create one! Entries are due May 15, 2016. Find out more at http://www.envirocentre.ca/photocontest. Amazing, transformative, hopeful–these are some of the ways people are describing the Peoples’ Social Forum, taking place in Ottawa Thursday, August 21-Sunday, August 24, 2014. The Peoples’ Social Forum is a gathering of individuals and organizations working towards social, environmental and political justice. It’s been described as the largest ever forum in Canada of social movements, with thousands of people and more than 200 groups attending. They’re coming together to work through issues, find common ground and propose changes to the unsustainable, unjust and inequitable way things are done now. Also included is a “People’s University” with workshops on topics such as poverty, capitalism and pipelines; Assemblies on Indigenous solidarity, water, social economy, climate change, mining justice and more; a children’s forum; and a range of other events. Following an Algonquin ceremony at sunrise on Thursday, Aug. 21, the Forum launches with a Unity March on Thursday, Aug. 21, starting at 2 p.m. at Jacques Cartier Park and the War Museum, arriving on Parliament Hill around 4 p.m. with speakers, music and cultural activities. There are lots of associated activities that are open to anyone to attend. The Art Sparks Change Festival is happening along Sparks Street, with live music, art and performance (see the schedule here). Some highlights: The Winter We Danced concert, book launch and round-dancing on Thurs. at 7 p.m.; a “Breaking Good” break dancer jam on Fri. 12-2 p.m.; “Poetic Justice” spoken word, hip-hop and slam poetry on Fri. 6-10 p.m.; and a Traditional Pow-Wow on Saturday from noon-6 p.m.
Events at other venues include (for example): “A celebration of activism and independent media” on Thurs., 5 p.m. at 25One Community; “Material Witness: Art, Activism & Fibre” on Fri., 7 p.m. at Gallery 101; Asinabka Best Of 2014 and “Upping The Anti” journal Launch Party on Sat., 7 p.m. at Club SAW; an open stage on Sun., 7 p.m. at Celtic Cross Pub; and tons of music, poetry, performance art, film and video, art exhibits and more. Many of the events are free or pay-what-you-can. I also recommend checking out the themed walking tours of downtown Ottawa on topics such as money, labour and local food solutions, led by Ottawa (de)Tours and on Indigenous social, political, cultural and artistic spaces, led by Indigenous Walks. Running such a huge, multifaceted and diverse gathering that aims to give everyone a voice while respecting differences will be challenging, but the Peoples’ Social Forum holds much potential. Sharing of good ideas, respect for Indigenous lands and rights, action towards positive social, political and environmental change and continued collaboration after the Forum are some of the possible positive outcomes. Above all, it’s a place to meet people, listen to perspectives that aren’t heard often enough and learn about and negotiate creative paths forward. You can download the full program, find out more and get registration information at http://www.peoplessocialforum.org/home/. Follow on Twitter at #PSF2014 and @forumsocial2014. Some events will be livestreamed at http://www.livestream.com/rabbletv. 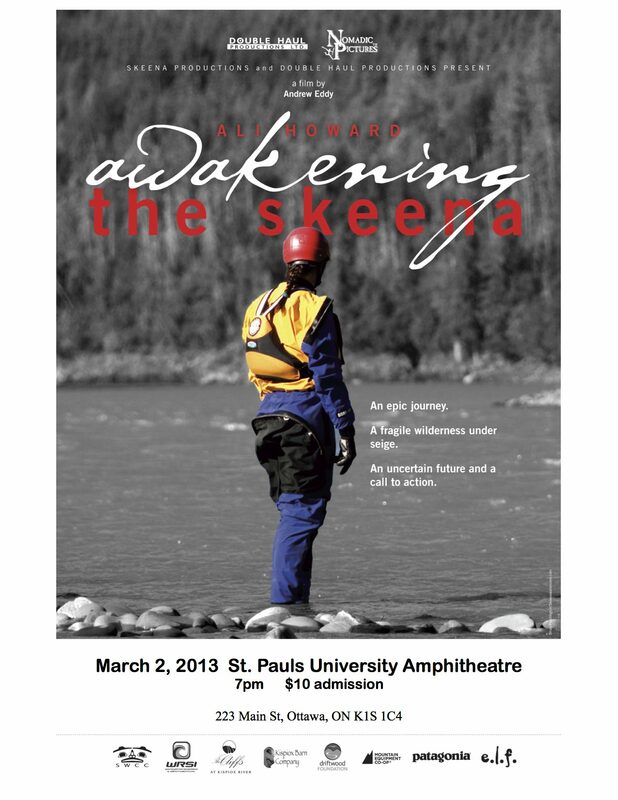 Author and speaker Chris Turner is in Ottawa this week. 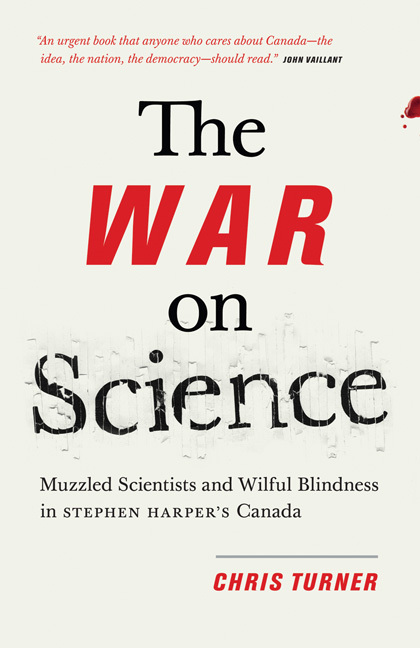 His new book, The War on Science: Muzzled Scientists and Wilful Blindness in Stephen Harper’s Canada, is a must-read on how far Canada has fallen on environmental science, legislation and policy. Turner has also looked at what it would take for societies and economies to move towards sustainability. His The Leap: How to Survive and Thrive In the Sustainable Economy (2011) and The Geography of Hope: A Tour of the World We Need (2008) are positive about humanity’s prospects for living more sustainably, despite the environmental and political challenges we face and have created. Turner is also a prolific magazine writer, a consultant, a former Calgary Centre Green Party candidate and the author of Planet Simpson: How a Cartoon Masterpiece Documented an Era and Defined a Generation, so definitely brings a multi-faceted perspective. He’ll be at Perfect Books on Tuesday, Nov. 12, 2013 from 1-3 p.m, so check it out if you’d like to meet him or learn more about his books. Later on Tuesday, Nov. 12, 2013, Turner will be speaking at Carleton University about Germany’s Energiewende, or transition to renewable energy, and the implications of that shift for Ontario’s energy options. The session, “Tracking the German Leap,” is presented by the Embassy and Consulates General of the Federal Republic of Germany in Canada, Turner’s Leapworks and BMW. It’s 5:30-7:30 p.m. in Room 720A, Loeb Building at Carleton University; register at http://www.eventbrite.ca/event/9163035887/es2. Behind the film’s unassuming title is a powerful documentary that tells of one person’s decision to step forward and do something about the environment. 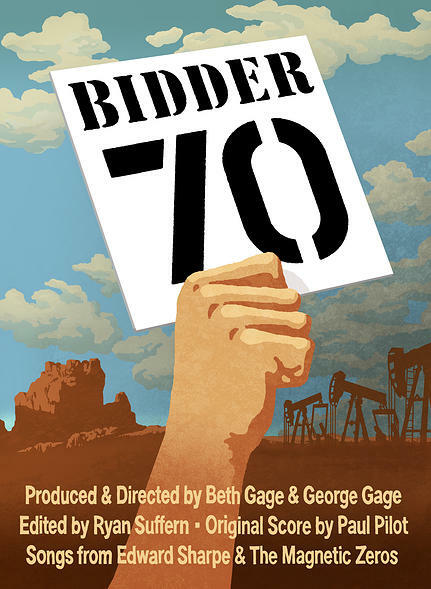 Bidder 70 tells the story of Tim DeChristopher, an economics student in Utah who entered an oil and gas lease auction and as “bidder 70” outbid others to acquire lease rights on thousands of acres of land before the auction was stopped. Charged with federal felonies, DeChristopher co-founded Peaceful Uprising, a non-profit group dedicated to addressing the environment and climate change by supporting non-violent action. DeChristopher served a two-year sentence and was released earlier this year. Bidder 70, which has won 20 film festival awards, is showing at the Mayfair Theatre on Thursday May 30, 2013 at 7:00 p.m. It’s a fundraiser for the Sierra Club and Peaceful Uprising. Filmmaker Jennifer Baichwal’s documentary Payback explores the notion of debt—debt of all kinds, including financial, social and environmental—and how ideas about what we “owe” influence our lives. 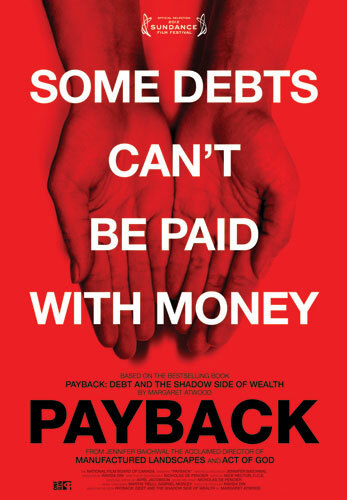 The film, described as “riveting and poetic,” is based on Margaret Atwood’s book Payback: Debt and the Shadow Side of Wealth. The film includes perspectives from Raj Patel (author of The Value of Nothing and Stuffed and Starved) and Louise Arbour (former UN High Commissioner for Human Rights). One of my favourite environment magazines, Alternatives Journal, is hosting a panel discussion on the role of science in protecting Canada’s environment and Canadians’ health on Tues., Sept. 25 at 1 p.m. Panelists include Dr. Robert Paehlke, Professor Emeritus at Trent University and Alternatives Journal founder; Dr. Adam Brown, Assistant Professor of Biology at the University of Ottawa; Dr. Scott Findlay from the Institute of the Environment and Associate Professor of Biology at the University of Ottawa; and Professor Kathryn O’Hara, CTV Chair in Science Broadcast Journalism at Carleton University. It’s at the University of Ottawa, Demarais Building Rm. 12110. There’s a presentation on the legacy of Algonquin Elder William Commanda on Tues., Sept. 25, 7-8:30 p.m., at the Ottawa Public Library’s main branch. A photo exhibit on his life runs at the library until Sept. 30. Both are part of the sixth annual Ottawa Peace Festival. Sept. 22-29 is also Organic Week in Canada, so why not celebrate with some local organic produce?